NBC 6's Tony Pipitone reports on the development of the FIU bridge that collapsed on Thursday, killing at least four people. 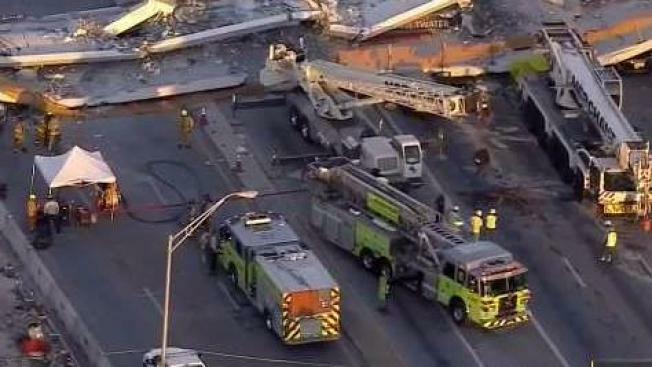 A 950-ton pedestrian bridge near FIU collapsed Thursday, killing several people and crushing cars. Authorities are working to determine the cause of the bridge collapse. Four people were killed in the incident. The pedestrian bridge that collapsed at Florida International University was not being run by the Florida Department of Transportation despite it crossing over a state road. The proper and safe completion of the project was the responsibility of the team FIU hired to design and build it, according to FDOT. The state revealed the company selected to do an independent, secondary review of the project was not pre-qualified by FDOT for the service it was hired to do. That company was selected by what's called the design build team made up of the designer and contractor. The bridge designer was Tallahassee's Figg Engineering and the contractor is Munilla Construction Management of Miami. FDOT says the two companies were under contract with FIU and it was that team's responsibility to hire a firm to conduct an independent, secondary review. The state identified the firm that's not FDOT pre-qualified as Louis Berger. Because the design of this bridge was unique, that's the reason they state said a secondary review was required. No reason was given why Louis Berger wasn't pre-qualified for this work. The firm does do other business with FDOT. Emails to company representatives weren't immediately returned. The primary inspection was being done by Bolton Perez and Associates of Miami. FDOT says they are what's called the CEI or Construction Engineering & Inspection team. The pedestrian walkway was built at an off-site location and put into place over SW 8th St. on Saturday morning, March 10. It was being built to provide a safer way for people to cross the busy road between the FIU campus and Sweetwater. FDOT says it played a role in traffic control for the Saturday event as well as other duties including acting as a pass-through for federal funding, providing $57,000 of the $16.5 million project, reviewing compliance of the terms of the agreement and authorizing FIU to build the bridge over the state road. FDOT says FIU and its contractors are "solely responsible to inspect and maintain" the bridge at the university's expense.